Cayenne pepper is more popular as chilli pepper and is spicy due to the presence of capsaicin. it is an important ingredient in many dishes and is also used for seasoning. Cayenne pepper mixed with lemon juice can make any dish spicy and appetizing. You can use dried cayenne pepper at home. Store it in an airtight container and it will last for a long period of time. It is rich in vitamins and minerals and is also anti-inflammatory, anti-allergen and anti-fungal. 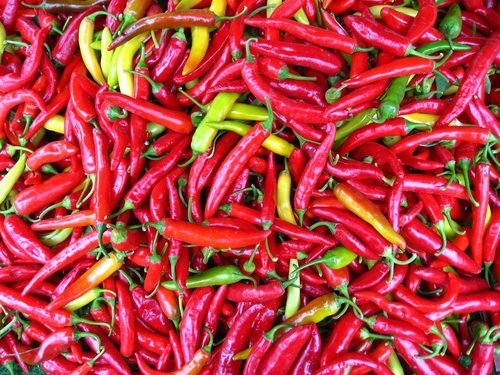 Cayenne is good for those who suffer from acne. It treats acne and prevents it from appearing again by increasing the flow of blood in the skin. If you include cayenne pepper twice daily in your regular diet, you will a great decrease in acne. Being a rich source of Vitamin C, Vitamin E and many antioxidants, cayenne pepper is ideal for the health of your skin and keeps it smooth and glowing. It is often called as the master herb for the skin. Cayenne pepper helps you to get a smooth and soft skin that is free from any blemishes. Cayenne pepper is good for improving the growth of the hair. Apply it on your scalp and where you feel irritation. This is good for increasing the blood circulation in the scalp. As poor blood flow is one of the main reasons for baldness, this helps in increasing hair growth and preventing hair fall. To take full advantage of the benefits of cayenne pepper for the hair, take 25 gram of cayenne pepper that is made into a powder and then mix it with half a liter of olive oil. Take care to keep this mixture in a dark bottle and then store it for 12 to 15 days. After the stipulated time, take it and apply the oil on your scalp, massage well and wrap your hair with a hot towel. Leave it that way for an hour and then wash off with a mild shampoo. When you shampoo your hair, make sure that all traces of the mixture are removed. Apply a conditioner after you shampoo your hair. By doing this regularly, you will get thick and shiny hair. The anti-bacterial properties of cayenne pepper make it excellent for preventing contamination of food by bacteria. Cayenne pepper increases blood circulation as well as the digestive process and the lymphatic rhythms. As a result, the body is heated and this helps in removing toxins from the body. It also causes sweating of the body, which is another easy way to remove toxins from the body. Cayenne pepper helps to increase the production of saliva, which is needed for the proper digestion of food and for the oral health. Cayenne pepper has antifungal properties and thus it helps in protecting you from various infections. Cayenne pepper is good for your digestive system as well. It stimulates the production of enzymes and gastric juices needed for digestion. It is very effective in treating ulcers by peristaltic movement of the intestine. Other problems related with digestion like gastric problems and cramps are also treated by cayenne pepper. Cayenne pepper is excellent for maintaining a healthy heart. It has the ability to stop heart attacks within a few seconds. This is because it can open up the arteries and the heart and ensure proper circulation of the blood. Cayenne pepper prevents blood clots and therefore prevents heart diseases and strokes. Cayenne pepper is effective for those who want to lose weight. Consuming this burns the excess fat in your body thus reduce your weight. It also increases metabolism and thus reduce weight. Cayenne pepper has the added advantage of decreasing your appetite, so that you tend to eat less. Cayenne pepper is good for those suffering from sore throat. When you gargle with warm water, mix some cayenne pepper also. This way you get recovered from sore throat fast. Cayenne pepper provides you relief from pain. If you are suffering from migraine or any other form of headache, have cayenne pepper in the form of solution and you will get relief immediately. It is also good for those suffering from sinus and tooth pain. Various gum diseases are also treated by cayenne pepper. Just like the skin and the health, cayenne pepper is good for the hair also. It increases the growth of the hair and provides you a thick and strong hair. It also makes your dull and lifeless hair shine with new vitality. This is done by increasing the blood circulation in the scalp. So, if you feel that you are suffering from hair loss problems, include cayenne in your daily diet and see how it transforms your hair. Cayenne pepper prevents cancer and this is considered as one of its greatest benefits. This is due to the presence of a substance called capsaicin. It kills cancer cells in the lungs and the pancreas through a process called apoptosis. So, consuming cayenne pepper is good for those who smoke tobacco and are at a risk of tobacco induced lung tumors. Cayenne pepper improves your blood circulation and ensures that they flow smoothly. it reduces the formation of palettes and also prevent them from forming in to a clump and interrupting the blood flow. As a result, blood pressure is lowered in natural way. So include cayenne pepper in your daily diet and stay away from hyper tension. Including cayenne pepper is good for weight loss and in speeding up the metabolism.